Note: The Anglaise Sauce and Caramel sauce need to set over night. The Swiss Meringue is made a la minute prior to serving. 1. Combine milk, cream and vanilla in a small saucepan and heat until almost boiling. Remove liquid from heat. 2. In a separate bowl whisk egg yolks and sugar together. Slowly whisk the hot liquid into the egg mixture. Make sure to temper the eggs properly (very slowly) or you will end up with scrambled eggs. 3. Strain the custard (mixture) back into the saucepan. Heat the custard over a low heat stirring continuously so as not burn. Heat until the custard is thick enough to cover the back of a wooden spoon or hold its shape if a finger is drawn through it. Remove custard from heat. 4. Strain the custard in a bowl over an ice bath. Let the custard cool over the ice bath for approximately 5 mins. Place in an airtight container. Cover the top of the sauce with plastic wrap to prevent a skin from forming on the top of the sauce. Allow sauce to set over night. 1. Gently place sugar, water and lemon juice in small sauce pan. Bring the mixture to a boil over med heat. Remove the sugar mixture from the heat when the sugar is a medium amber colour. 2. Whisk in heavy cream. The cream will boil intensely for a minute. Add butter and salt. Place back on heat whisking for 1 minute. 3. Add butter and Salt. Place back on heat whisking for 1 minute. Place in a heat safe container and refrigerate. The caramel sauce needs to set over night. 1. Prepare a Bain Marie. Whisk egg whites, sugar and lemon until combined in a heatproof bowl. Place Sugar mixture over the Bain Marie. Continually whisking the mixture until it feels warm to touch and the sugar has dissolved if rubbed in between your fingers. 2. Take off heat. Quickly transfer to an electric mixer and whisk on medium setting. Add vanilla. Slowly bring up the setting to high on mixer. The meringue is ready when it reaches stiff glossy peaks. 3. To make the Meringue Islands, scoop the meringue or use 2 spoons to form a Quenelle shape. You can try using different shape and size spoons to find the look and size of the island you like best. Enjoy! 1. Place the Meringue Islands on a serving plate. 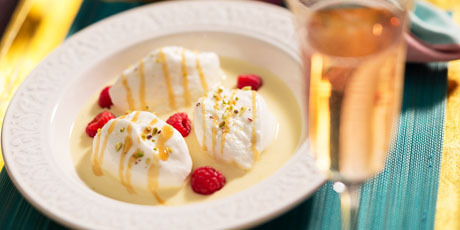 Gently pour the Crème Anglaise carefully around the meringue islands. Drizzle Salted Caramel Sauce over the meringues. Top with roasted nuts. Add fresh berries. Enjoy!